The distance between God and man is measured by, simply, power. On this level, if I’m on the surface of my being, only this is real: what my senses allow. But if I go deeper into my own being, moving ever towards the core of my being, who is God, then my imaginative act becomes externalized– QUICKLY externalized, as I go deeper and deeper. On the surface, it seems to take an interval of time– IF I believe. If I don’t believe, it never comes into some external form at all– never. Yet I’m living in a world not understanding it, not knowing what it’s all about. So really the story I want to tell you is trying to ask you, PLEAD with you, to BUY YOUR RELIGION WHOLESALE. Go to the Maker. Go to the source. Don’t buy it retail from some man in-between. 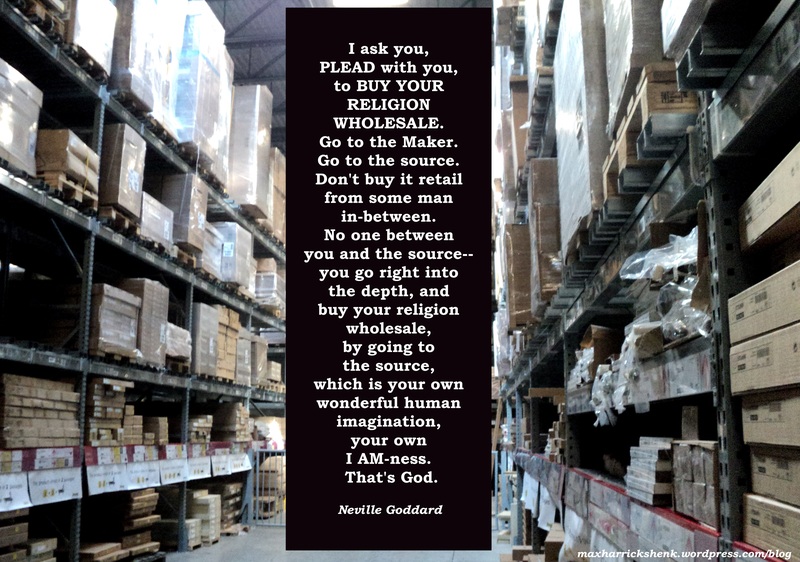 No one between you and the source– you go right into the depth, and buy your religion wholesale, by going to the source, which is your own wonderful human imagination, your own I AM-ness. That’s God. Click here to read other blog posts about Neville Goddard. Two collections of quotes, passages and lectures from the mystical teachings of Neville Goddard, available now as e-books.